Shane Shirley : Guess What Just Went Organic? Yummy Earth Organics!! Guess What Just Went Organic? Yummy Earth Organics!! Big news! Candy has gone organic! 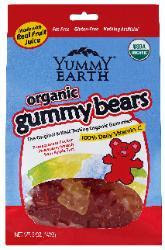 Candy such as gummy bears and lollipops has gone organic thanks to two daddies and Yummy Earth Organic. If you have been to places like Marriott Hotels, Disney World and Toy-R-Us you probably saw the lollipops on the counter but thought they were not healthy. Next time look more carefully, pick up the candy and see what it says. If it says Yummy Earth Organic, pick it up and eat it and give it to your kids. One thing that I think is so great about Yummy Earth is that the wonderful gummy bears have less than 90 calories and a full 100% of vitamin C per snack pack. There are flavors that your kids will be blasted out of their minds to eat like Pomegranate Pucker, Sour Apple tart and Apple Smash. One issue parents think about everyday is “What is my child having for snack? Is it something healthy or is it junk food?” Well that problem is now going to be out of the way with Yummy Earth Organics. All the food your kids love (and maybe even some you love) can now be enjoyed without worry. Now if your child wants a delicious snack for school, they can have organic Yummy Earth snacks. The two daddies that invented Yummy Earth Organics are on a mission to feed their kids and other children of the world foods with no chemical colors, artificial flavors or corn syrup. But they don’t stop there. Yummy Earth Organic makes the only USDA Certified Organic Gummy Bears and Gummy Worms in the United States and they are EU certified. If you are having trouble finding a good candy that’s organic and is not the candy that’s bad for you, choose Yummy Earth Organics. After reading this I hope you have learned a few helpful facts about Yummy Earth Organic and their delicious products. Remember to put Yummy Earth Organics on your grocery store list. A big "Thank you so very much!" goes out to one of my favorite, all time guest post authors, my 10 year old daughter Lexie, for this awesome information! Lexie found a Yummy Earth Organic sucker in our candy stash (yes we have a stash of "healthy" candy) and wanted to share her great find with people. PS - we get ours at Publix for a couple of dollars. I am so proud of you for writing this! I hope that more young people take time to think about their health and get informed and take action like you did! I can't wait to show this to Jonah, my 5 1/2 year old boy, and Rose, Sergio's 4 1/2 year old girl! We invented YummyEarth for them and they will be so thrilled to see that big kids like Lexie share their love for YummyEarth organic lollipops and drops and gummy bears and worms. thanks, Lexie. well done! PS I found your great blog using Google's cool tool to alert us when people blog or write about YummyEarth. Way to go, Lexie!!! You rock! I just wish we got Gummy Bears in South Africa too. Thanks Yummy Earth and Gillian for your comments. Lexie and Yummy Earth Rock! Thank you so much for the comments I appreciate it so much and hope I will get to a new blog soon about more ways to go green.